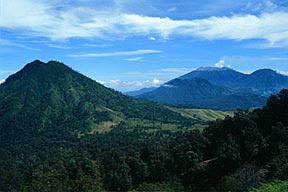 In June of 1997 I was fortunate enough to be working in east Java. 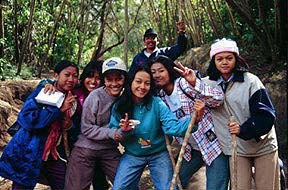 The following is a narrative of a day spent on Ijen volcano. Photos and text by Steve Mattox. Four of us went off to see active volcanoes in the north. Easy start in the morning made easier with having an ice cream bar for breakfast in addition to some star fruit and coffee. The drive was beautiful as always. This is really a beautiful country. Lots of green. 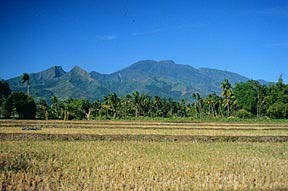 Almost endless rice fields, plus corn or tobacco or coconut. Always people to watch. And if things get boring traffic is always amazing. Raung (right) is named for the sound that tigers make. 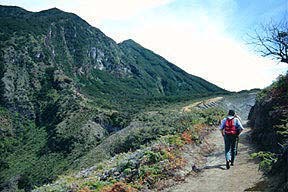 The summit is a long ridge and very jagged. Fresh gray-brown rock surrounded by forest. We never got very close but it formed a nice reference in the distance. 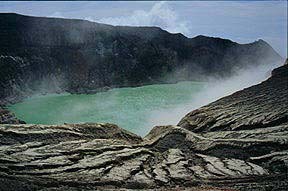 We got to the west flank of Ijen. 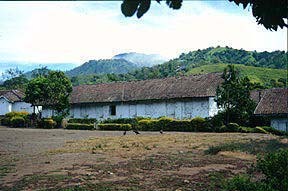 Argopuro (above), an extinct and eroded volcano was to the west. Ijen is a stratovolcano and the drive up the slope was pretty easy. People would point the way. Crossing into the caldera at the summit was great, very beautiful. There are several large cones (extinct vents) that have formed on the old rim, each a bit different and all beautiful. The rim is steep and pretty obvious that it is a caldera (don't know when it formed, doubt if anyone does). Inside it is lush and green, mostly planted in coffee. We passed through a couple small villages. I took photos of houses with the vent fuming in the background. We visited a blocky lava flow and were amazed at how similar the textures and composition are to our rocks, a good educational stop (uniformitarianism at its best). The set up for climbing to Ijen's crater is pretty well organized by Java standards. A real parking lot, trail head, sign in book and a few groups of people about. The hazard map for Ijen (lahars and pyroclasts) was posted (12,000 people in 70 villages live in a 10 km radius of the summit). The trail went up fairly steeply, about the angle of repose . Most of the time we were in good forest complete with tree ferns, at least three types of ground ferns, and beautiful trees, some with yellow flowers. Felt like Hawaii forest. 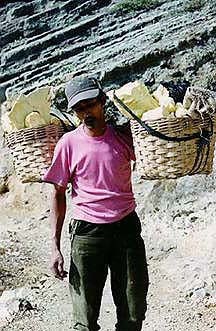 Almost immediately we encountered men carrying sulfur blocks down from the summit (see below). People were very nice and said "hello" as we passed by. A group of girls that spoke English asked me where I'm from, etc. They were full on energy and were happy to pose for a photo. One girl was eager to point out she was from India. It is great to see the cultural mix here even though they are all Indonesians. Anyway it took about two hours to climb the roughly 2,000 feet up to the crater. The crater is another world. Light green water in the crater lake. Light colored rocks, hard to look at in the bright sun. Gas clouds pouring from vents near the side of the lake. And a blue sky with wisps of clouds. I loved it and immediately sat down to soak it in. The youngest layer is a surge deposit plastered against and climbing out of the walls of the crater. 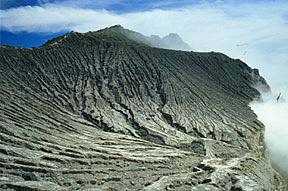 Older lava flows and tephra layers were exposed in the crater walls. In the crater and down by the sulfur vents I could see people moving. Note the person in the lower left for scale (boulders in foreground are big). Just before we started down to the lake and sulfur vents a man emerged carrying his load of sulfur blocks. He had a stick with two baskets. He said he carried about 80 kg (170 pounds). I later tried to lift a basket and could not. These men carry these loads up the steep crater wall. The trail is ok for walking but crazy for carrying these loads. The men gradually shift the load from one shoulder to the other. They wore rubber boots or flipflops. Most asked for a cigarette. Most were young. They get paid about $4.25US for each load they carry out. One load a day, maybe two. An incredibly small sum for the damage they do to their lungs and spine but a good day's pay in Indonesia. In general I felt safe. 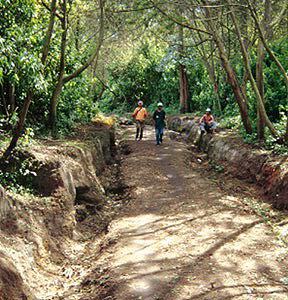 My moment of uneasiness was when I realized that there was numerous car-sized boulders near me. They had rolled from a lava flow that towered over me in the crater wall. I had flashbacks of glaciers calving. So I keep moving, pausing only for photos or to let the sulfur men trudge past. The sulfur works looked like something out of a sci-fi movie. Definitely alive but alien. A man scurried about whacking sulfur from pipes, disappearing in the clouds of gas. Pipes help transport the gas from the vents to a work area where it precipitated. The pipes looked like fingers of a hand holding the yellow rock. Bright yellow or orange stalactites formed in the pipes. Other men loaded baskets. No one cared that we were about. I stood close to the vents/pipes until the wind shifted and I couldn't see or breath very easily. 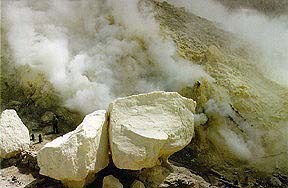 They move 9-10 tons of sulfur each day. The lake is about a km by half a km. A natural dam is on the other side. The lake shore was narrow. I collected some sand from the beach. The water was clear but turned light green just of shore, maybe suspended sulfur particles. There were areas of upwelling and the gas from the vents drifted across the lake. I wonder if there is life in this pool of acid . I didn't stay long, once again the winds were carrying the sulfur to me. Best of all was the no swimming sign. The walk out was fine. Steep. Great views. Great forest. We left the summit and headed east. More great outcrops of ash fall deposits and lava flows. On the lower slopes there were corn fields and cabbage patches. The people lived in very simple huts and did not seem as well off as people near my work area (still they seemed happy, kids playing). Down lower, endless fields of terraced wet rice fields. The long drive home was outrageous as always. I never want to drive here. 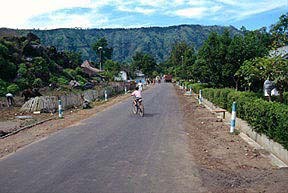 Two lane road, pedestrians on the shoulder and just on the road, then bikes, then scooters and motorcycles, then cars and trucks. It is common to come around a bend and find a large truck or motor coach in the center of the road. Horns blast and humanity shifts to avoid the collision by mere inches. Becaks (trishaws) and old men pushing large foodcarts (always without reflectors) make things even more difficult. Yet Gotok, our driver and logistics manager, seems unbothered and maneuvers skillfully. I tried to relax and checked my seatbelt again. Even after a good wash I still smelled like sulphur. It was a good day.